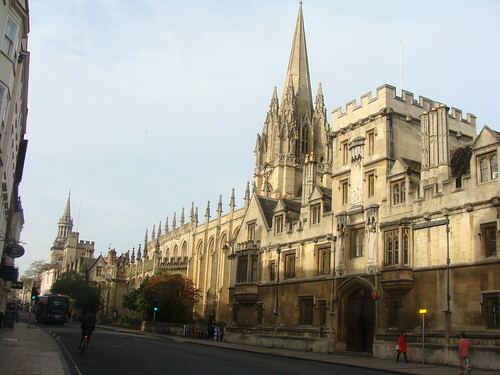 Once I said goodbye to my stint as an Oxford student, I returned to regularly scheduled business: exploring Oxford with my minimal budget. UK, we really have to talk about how my US $1 is worth about .60 cents! I didn’t pay to enter any buildings or do any exhibit that wasn’t free. In the end, I saw some pretty great sights. 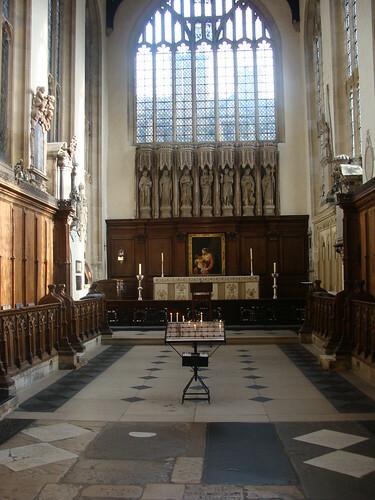 My first stop was the University Church of St. Mary the Virgin which was less than a minute walk from where the coach dropped me off on London’s high street. Entry was free with just a recommended donation. 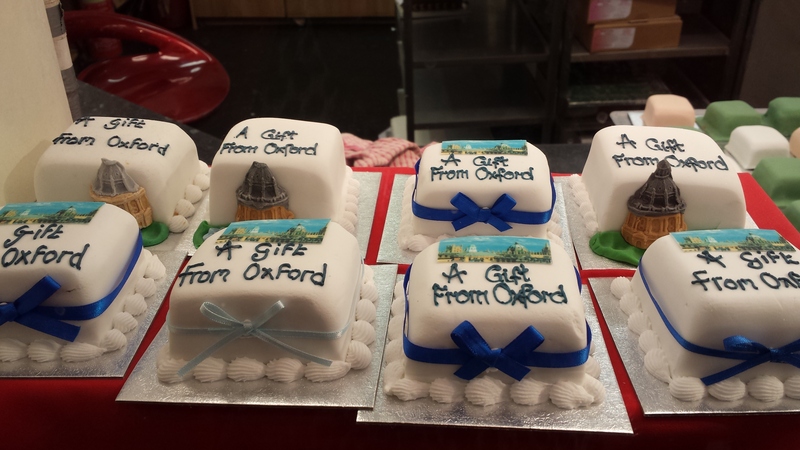 I decided against the 4 GBP to take in the tower and view of Oxford. Hey, that 4 GBP was spent on a pint, thank you very much! The view of St. Mary the Virgin Church from the street. Pretty impressive, heh? I lit a candle of gratitude for my travel adventures. I was aiming to capture the gorgeous organ that took center stage. 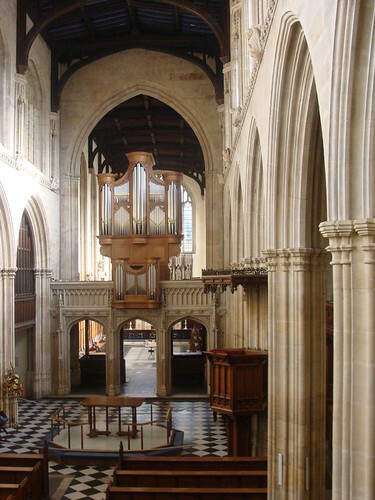 Called The Great West Window, you get to it by climbing a set of stairs to a gallery of seats that must house the choir. 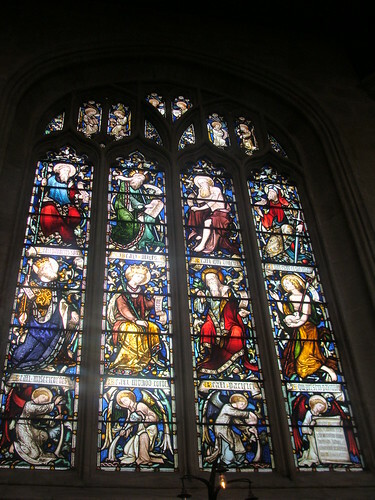 The Window was finished in 1891 and shows the tree of Jesse surrounded by figures from the Bible. 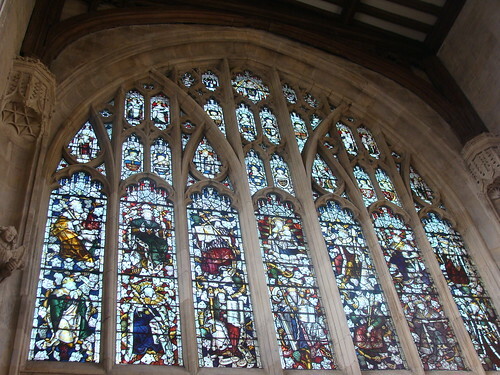 This glass depicts the life of my favorite Apostle, St. Thomas (the one with all the questions). 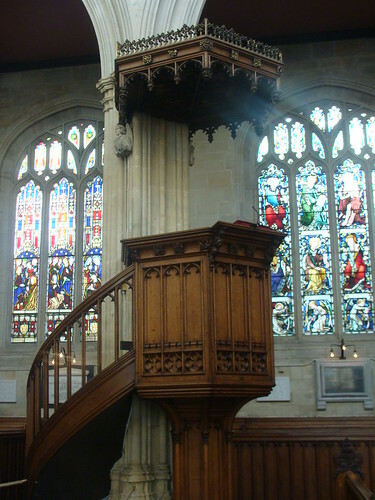 I can almost imagine a fire and brimstone message coming from a preacher on this almost floating pulpit. As you exit the church, you enter Radcliff Square which houses the Radcliff Camera, a circular library that was unfortunately closed to visitors. It’s the science library for students. 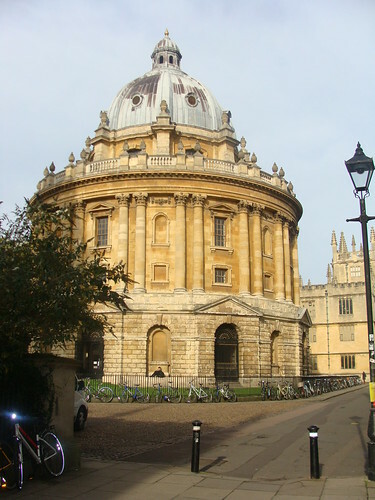 After passing by the Camera, you enter a series of buildings that are a part of the Bodleian Libraries. I didn’t choose to enter but just kept walking about the structures and came up to the north view of the library which was so striking, I stood there for a good 5 minutes just looking at it. 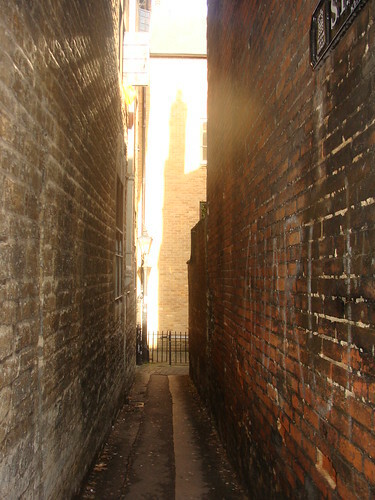 This narrow area between the upcoming Sheldonian Theatre and the Clarendon Building is the Old Schools Quad. 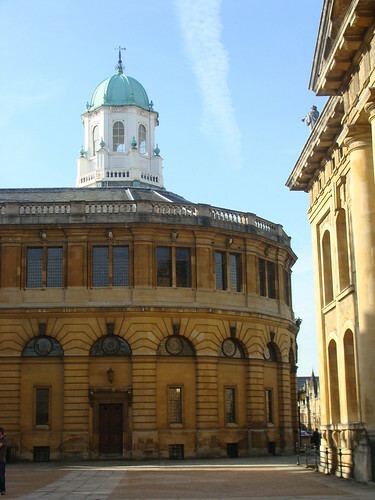 I then passed the Sheldonian Theatre which is where all major Oxford University ceremonies take place including student graduations. A series of gargoyles aligned the Theatre’s awning and though they serve a useful function, which is to throw water off the building, I was just amused by their expressions. 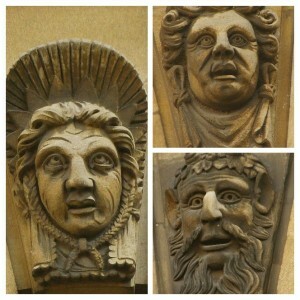 Gargoyles – each has such a distinctive look that I found myself slightly entranced by them. 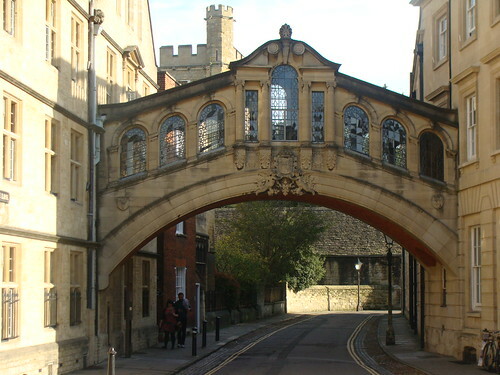 To the east of the Theatre is the Hertford Bridge, also known as the Bridge of Sighs. 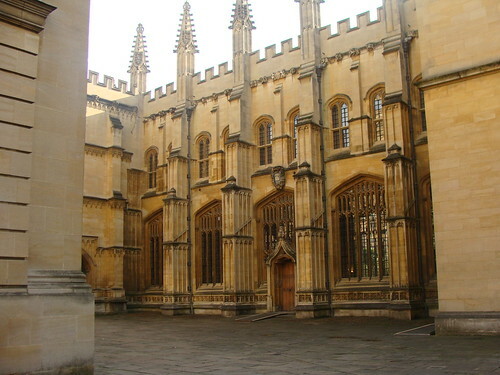 It supposedly bears a striking resemblance to the original Bridge of Sighs in Venice. I don’t think the Italians would agree. Beneath the bridge was a passage that besides being very cool and not somewhere I’d like to be at night, led me to the Turf Tavern which fulfilled my need for a good Sunday roast. Unbeknownst to me it is famously the place Bill Clinton did not “inhale” in the 70s. Ahh, walking in the “1st Black President’s” footsteps. No inhaling was necessary for me as I just sampled the cider which made me tipsy from just a pint. Either I’ve become a lightweight, or the Brits stack their ciders with a bit more alcohol. 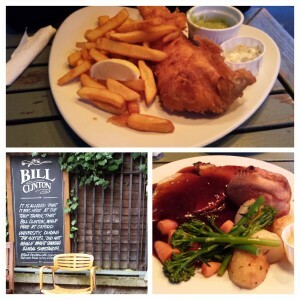 My Sunday roast… my cousin stuck to the old favorite of Fish and Chips. 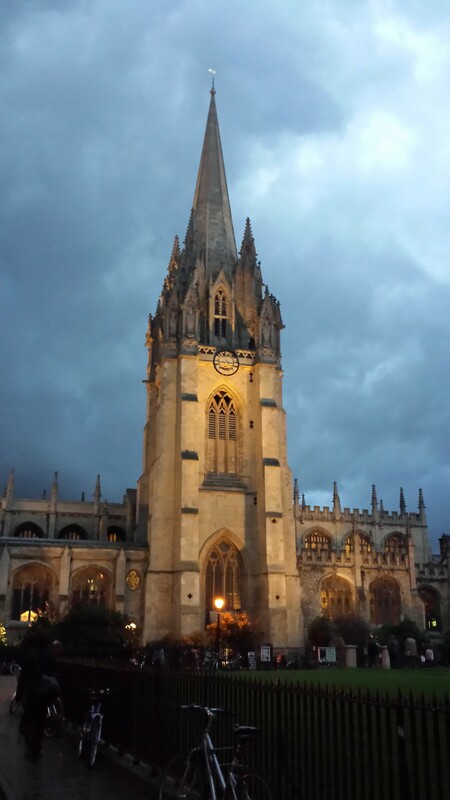 On the return to my room, St. Mary the Virgin Church was a lovely spooky sight.